The compact camera design fits perfectly on the UR wrist and offers direct connectivity to the controller. Moreover, the Robotiq Camera’s user-friendly software is seamlessly embedded within Universal Robot’s graphical user interface. There is no external PC required to setup, program or run Camera. Everything is done right from the robot user interface. You can teach Robotiq’s Camera a new part in just 5 minutes, and it will locate the part in its field of vision. 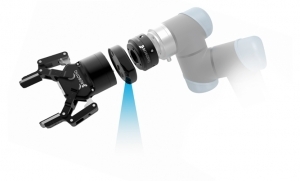 Because of its unique wrist mount design on the UR, this robot vision system does not need complex calibration procedure or extra external illumination. Being mounted on the robot's wrist also has the benefit of expanding the search area without dealing with complex fixtures. “The robot's arm moves, so the Camera can locate the parts in a wider work area,” explains Jean-Philippe Jobin, Robotiq’s CTO. Robotiq’s vision system for Universal Robots is commercially available now. A live demonstration of the product can be seen at Robotiq’s booth at Automatica 2016, Hall B5, booth 512.